With as much new technology that Tangent packs into their all-in-one medical computers, one does not expect to see any sort of legacy components included. However, if you look at the I/O ports on the back of the Tangent M24T medical computer, something surprising is present: three RS-232 DB9 ports. For those of us that are not polished up on our knowledge of every serial port that ever existed, the RS-232 is a standard computer serial port for communication that dates back about five decades, and was used for a wide array of purposes like connections to modems, printers, mice, data storage, circuit protection, connectors, optoelectronics, passive components, uninterrupted power supplies, and more. This is all fine and dandy, but the questions still stand. What are serial ports from the 60s doing on new computers? What does this have to do with medical standards? Why don’t they just solely use USB? Well, simply put, medical devices have varying ways of providing data to computers. 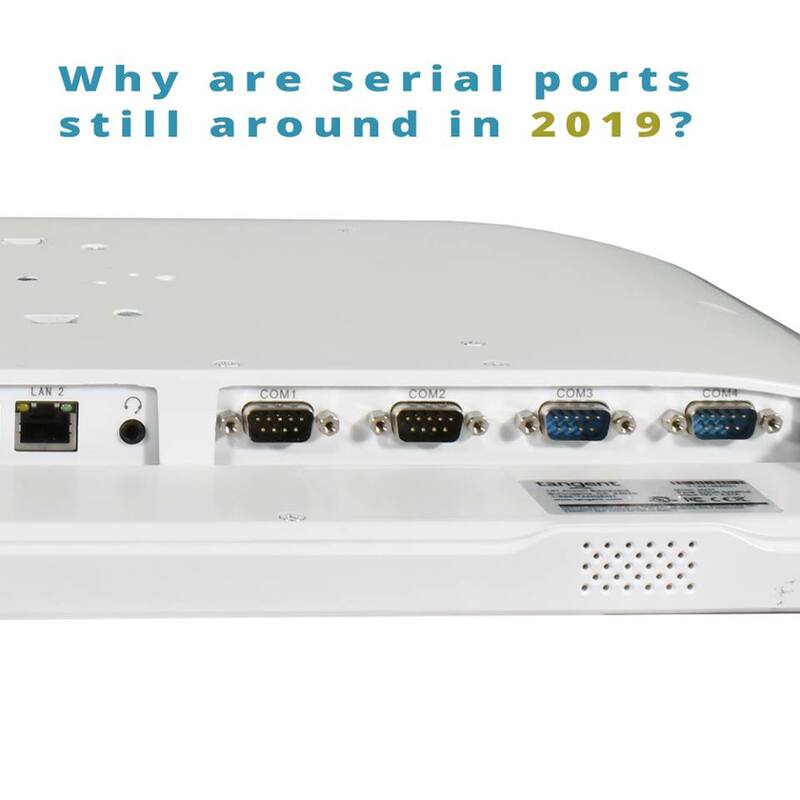 Most still have uncomplicated serial ports, while newer ones have HDMI, ethernet or USB ports, depending on the protocol being used for communication. A true medical computer needs to be able to fit the requirements of each medical device it’s connected to, as well as the clinical workflows of the medical facility and that particular care center’s IT environment. And the old RS-232 interface is an attractive alternative to the more temperamental digital interfaces for many medical device manufacturers because it’s robust, consistent, and easy to use. The adage of “if it’s not broke, don’t fix it” applies heavily for the serial port standards in a great number of devices. Tangent’s dedication to providing convenience and value to medical care providers led to the inclusion of the trusted legacy ports. The M24T medical computer is able to connect to a kidney monitoring device, an ultrasound device, and a patient monitor using the serial ports, and still have 6 USB ports and an HDMI port free for other uses. All the newer, fancy bells and whistles are bundled up into this incredible medical computer as well. It features a 24 inch PCAP touchscreen monitor, an Intel 6th generation Core i Series, fast memory up to 32GB, and high-performance NVMe storage. The M24T medical computer also has fanless cooling by way of heat pipes, it’s own internal speakers, and optional webcam and RFID. The medical computer has an uninterrupted power supply battery for up to 30 minutes of operation during a power loss event, and of course, is factory treated with an antimicrobial coating to ward off the spread of infection from bacteria or mold. It’s easy to dismiss older technology as useless and disposable, but in the medical world, efficiency and consistency in the face of emergency situations often wins out over the new and questionable. Yes, strides are being made to upgrade older hospital systems to modern standards, but change in these sorts of environments can be slow. With so many devices still relying on legacy ports, it makes sense that medical computers still cater to their needs.